“The 7 Great Prayers for a Lifetime of Hope and Blessings” by Paul and Tracey McManus introduces readers to the idea of embodying faith and gratitude. Married couple Paul and Tracey worked collaboratively to produce this book. As thoughtfully documented in the text the authors drew inspiration from personal experiences and their own relationships with God when writing the book. They write to encourage others to maintain an ever thankful approach to life even when facing some of their most difficult challenges. 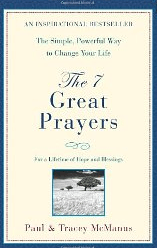 As the title implies, the book focuses on seven unique and heartfelt prayers. Additionally, the writers pepper the text with touching personal anecdotes. Each of the seven prayers touches upon the subjects of love, thankfulness, faith, and intention. Within the book, the McManuses first invite readers to learn more about their own lives, opening up about difficulties they have overcome. These autobiographical accounts set the stage for the themes within the book. Next readers move on to learn the different prayers, and how to adapt each verse to their own unique situations within the world. Finally, the authors supply their audience with a journal and 21 day plan for truly making the prayers a physical part of everyday life. The journal is located at the rear of the book, and includes a day by day guide to completing the 21 day challenge. This journal serves the readers as an invaluable resource to accompany the lessons within the text. Through the journal, readers have the opportunity to play an active role in the prayer challenge presented by Paul and Tracey. After the 21 days, readers should begin noticing the blessings they have welcomed into their lives through their affirmative graces and attitudes. Additionally, after making an honest effort over the course of the three weeks the prayers become more routine and perhaps even lifelong habits. Offering further support, the authors provide journal refills from their website to encourage readers to maintain their prayer practice. Tracey and Paul’s authentic investment in the well-being of their readers is both touching and inspiring. A notable difference in Paul and Tracey’s book, as compared to other personal growth books on the market, lies in their sincere faith in God. While many other books may focus on similar themes, they lack the strong spiritual faith of Paul and Tracey. To the McManus couple God is not only all-powerful, but also friendly and inviting. Through their book, they introduce others to this concept of God, and remind readers that the tried and true method of prayer really works for improving one’s quality of life. The words and resources from Paul and Tracey McManus feel truly heartfelt and supportive. Readers are left with an enthusiasm for embracing a lifestyle of gratitude and taking joy in the many gifts of the world. If you are more inclined to describe God as universal love, divine light, infinite wisdom or some other word, you can easily do so and still enjoy the powerful intention to connect and empower your life through positive intention and trust in a higher power. This entry was posted in Books and tagged blessings, daily prayers, faith and gratitude, hope, paul mcmanus, prayer and intention, prayers, the 4 great prayers for a lifetime, tracey mcmanus on May 28, 2010 by courtney_slivka.